Grunge is a subgenre of alternative rock music that emerged during the mid 1980s in the American state of Washington (particularly in Seattle). The music scene was followed by a fashion trend. Grunge fashion mainly consisted of ripped jeans and flannel shirts. Doc Martens, combat boots, band T-shirts, oversized knit sweaters, long and droopy skirts, ripped tights, Birkenstocks, hiking boots, and eco-friendly clothing made were also popular items. The grunge clothing look did not evolve out of a conscious attempt to create an appealing fashion style. It was basically an alternative apparel concept that blossomed from a particular lifestyle in Seattle. It was sort of a “lazy” person look. It took on the feel of the wearer simply not caring too much about a particular aesthetic. It has been said that the clothing of this genre was cheap, durable, and sort of timeless. Certainly torn jeans, boots, and flannel tops fit that description. Grunge can possibly be defined as a thrift-store look or even a lumberjack look. Nothing too fancy. Essentially a slouchy and loose appearance. Grunge fashion plowed against the grain of the flashy aesthetic that also existed in the 1980s. 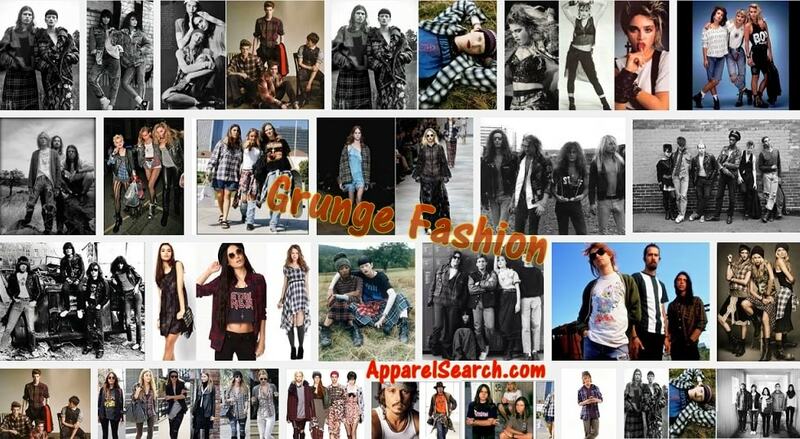 In mid-1992, grunge fashion broke into the mainstream for both sexes and peaked in late 1993 and early 1994. Grunge became commercially successful in the first half of the 1990s, due mainly to the release of Nirvana's Nevermind, Pearl Jam's Ten, Soundgarden's Badmotorfinger, Alice in Chains' Dirt, and Stone Temple Pilots' Core. Grunge typically fuses elements of punk rock and heavy metal, such as the distorted electric guitar used in both genres, although some bands performed with more emphasis on one or the other. The music shares with punk a raw sound and similar lyrical concerns. However, it also involves much slower tempos, dissonant harmonies, and more complex instrumentation, which is reminiscent of heavy metal. Lyrics are typically angst-filled, often addressing themes such as social alienation, apathy, confinement, and a desire for freedom. You may want to also learn about alternative apparel and punk fashion. Plaid shirts had been an important fixture of grunge fashion.